Australian sleepy lizards (Tiliqua rugosa) are monogamous and form very strong pair bonds with their partner. In our latest study we investigated why sleepy lizards form those strong bonds, instead of mating with different partners every year. We used a 31-year data set to investigate pair durations and rates of partner change. Many pairs stayed together for more than 10 years; and measured over a 5-year period, rates of partner change were below 34%. In one year, we equipped 14 pairs with GPS data loggers and recorded detailed movement pattern of each lizard, to determine interaction frequencies between pair partners. Lizards of seven of those pairs had been together before and were familiar with each other, the other seven were not. 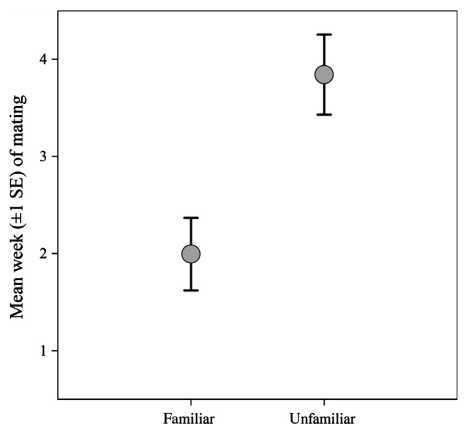 We found that familiarity plays a role in pairing behaviour and that familiar pairs mated significantly earlier than non-familiar pairs. Early mating often equates to higher reproductive success, and we inferred that is the case in sleepy lizards. We suggest that this provides some evidence for the mate familiarity hypothesis in this lizard species. Read all the details here. Tiliqua rugosa. Mate familiarity affects pairing behaviour. Familiar pair partners mate earlier than unfamiliar partners. 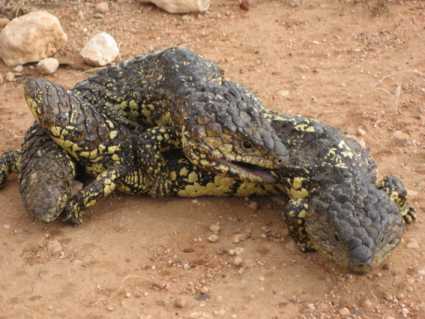 This entry was posted in Uncategorized and tagged lizard, monogamy, pair bond, Sleepy lizard, Tiliqua rugosa. Bookmark the permalink.